Details of the Verity family in the Grewelthorpe and Kirkby Malzeard & Masham district.Taken from census returns and parish records.Research started April 2013. Thanks to Ruth Verity for some of the following information. [Jan 2014]. ALICE JANE VERITY. Born C1887 Ilton. Dau of Peter Carter Verity & Hannah. Marries Dearlove Ellis of Kirkby Malzeard in 1915. ANNIE ELIZABETH VERITY. Born C1906. Died 1964. Dau of John & Annie Batty. ARTHUR ERNEST VERITY. Born 13.Feb 1880 East Witton. Died 10 March 1952 Australia. Married Esther Ruby Battersbys. of New Zealand. She died in Australia. CHARLES EDWARD VERITY. Born 3 Jan 1904. Dairy farmer. Married to Minnie [born 1910]. Living Low Speldersbank Fearby in 1939. CHARLES WATSON VERITY. Born C1904 fearby. Son of Watson & Jane Ann Craggs. CHARLES W. VERITY. Born 20 July 1909. Probably Married to Mary E. Gill. [born 1912.] Mary was his housekeeper in 1939. He was a dairy farmer at Manor Farm Fearby in 1939. CHRISTIE OSWALD VERITY. Born 1882 EastWitton. Died 1964. Son of Watson & Mary Horner. Married Ellen Sophia Weavers. CHRISTOPHER VERITY. Born 25.10.1825 Masham. Died 1874. Son of Mason & Margaret Watson. Married Jane Ann Robinson. of Fingall. Farmed Hammer Farm. Died when his son Matthias was very young. CHRISTOPHER EDWIN VERITY. Born C1910 Leighton. Died 1981. Son of Watson & Jane Ann Craggs. Living Leighton, Healey in 1911. Married Matilda I’Anson. in Dec. 1934. EDWIN VERITY. Born C1904 Masham. Died 1966. Nephew of William & Elizabeth of Howe Farm Masham. ELIZABETH VERITY. [nee Stott] Born C1834 Ramsgill. Married to John in 1863. In 1911 a widow living in Kirkby Malzeard. ELIZABETH LODGE VERITY. Born C1854 Middlesmoor. dau of Thomas [b.1809]. Living with brother Thomas in Fearby in 1911. Unmarried. ELIZABETH VERITY. Born C1858 Gownley Foot. A widow in Ilton in 1891. ELIZABETH VERITY. Born C1876 Masham. Sister of William. Housekeeper at Howe Farm, Masham in 1911. ELIZABETH VERITY [NEE ?]. Born C1880. Ilton. Widow in 1911. Farmer at Ilton. Mother of Margaret & George T.
ELIZABETH VERITY. Born C1884 Grewelthorpe. Dau of Peter Carter Verity & Hannah. ELIZABETH MAY VERITY. Born C1902 Healey. Dau of Watson & Jane Ann Craggs. Married Harry Spence. in 1929. ENA LILY VERITY. Born C1907 Leighton. Died 1992. Dau of Watson & Jane Ann Craggs. EMILY MATILDA VERITY. BornC 1887 Lodge Farm, Middlesmoor. Granddau. of John & Elizabeth Stott. EVA MINNIE VERITY. Born 1883.East Witton. Died 1956 Sussex. Dau of Watson & Mary Horner. Married in 1911 to Oscar E. Waterlow. in Japan. She had 5 children, 2 sons were killed in the WW2. EVELYN M. VERITY [NEE Alton]. Born 2 Nov 1916. Dau of Hannah Alton.. Listed as a Cowman at Firth Hse. Farm Low Ellington in 1939. before marriage. GEORGE THOMAS VERITY. Born C 1885 Healey. Son of Elizabeth of Gownley Foot. HANNAH VERITY. Born C1867 Studfold Farm. Middlesmoor. Dau. of John & Elizabeth Stott. Living unmarried with Mother in 1911. HARRIET VERITY. Born C1890 Pateley Bridge. Dau of John [the grocer] & Mary. HERBERT HORNER VERITY. Born 23 March 1879 East Witton. Died 1954. Son of Watson & Mary Horner. Married Blanche Edith Porteous. Blanche died in New Zealand. HERBERT VERITY. Born C1900 Stonebeck Up. Son of Thomas & Alice Jane. HERBERT R. VERITY. Born 8 Aug 1913. Widower. Farmer at Low Ellington Masham in 1939. Possibly son of Jane [born 1878] & Watson. HORENZO WATSON VERITY. Born 4.9.1881 East Witton. Died 17.9.1951. Yorkshire. Son of Watson & Mary Horner. Married Annie Elizabeth Metcalfe. Farmer at Warren House Ellington in 1939. Listed as a special motor constable in 1939. IDA MARY VERITY. Born 23 April 1905 Leighton. Died June 1987. Dau of Watson & Jane Ann Craggs. JACK VERITY. Born C1903 Fearby. Son of Watson & Jane Ann Craggs. JANE VERITY. Born C1853 Stonebeck Up. Dau of John & Mary Mawer. JANE ANN VERITY [nee Craggs] Born 22 March 1878. Low Ellington in 1939. Married to Watson [born 1874]. JAMES VERITY. Born C1868 Stonebeck Down. Son of John & Elizabeth Stott. JAMES VERITY. Born C1909. Died 1989. Son of John & Annie Batty. JAMES H. VERITY. Born Sept 28 1937. Son of Charles Edw. & Minnie of Low Speldersbank. JESSIE VERITY. Born C1902 West Houses Farm, Middlesmoor. Grand dau. of John & Elizabeth Stott. JOHN VERITY. Born C1813 Stonebeck Up. Butcher. A widower in 1871. JOHN VERITY. Born C.1830 Stonebeck Down. Farmer. Married to Elizabeth Stott. in 1863. JOHN VERITY. Born May 1845 Stonebeck up. Died 6.5.1921. Laverton. Son of John & Mary. Married to Annie Batty. of Bedale. Lived East View, K.Malzeard. Left £8,000 in will. JOHN VERITY. Born C1859 Ilton. Married Mary of Liverpool in C1883. A grocer in Pateley Bridge in 1911. JOHN THOMAS VERITY. Born C1889 Stonebeck up. Son of Thomas & Alice Jane. JOHN WILLIAM VERITY. Born C1901. Died 1991.Bridlington. Son of John & Annie Batty. JOSEPH CYRILL VERITY. Born 12.7.1887 East Witton. Killed 1917 Belgium. Son of Watson & Mary Horner. Emigrated to Canada in 1911. He was in the Canadian Mounted Rifles Battalion. A Private. His name is on the Menin gate memorial. LAWRENCE VERITY. Born C1902. Laverton. Died 1975. Leeds. Son of John & Annie Batty. Married Annie Walker. 1927 in Leeds. MARGARET VERITY. Born 1880 Healey. Dau of Elizabeth of Gownley Foot. MARY VERITY. Born 12.3.1823 Masham. Dau of Mason & Margaret Watson. Married John Croft. of East Witton. in 1861. MARY E.VERITY. Born C1887 Stonebeck Up. Dau of Thomas & Alice Jane. MARY JANE VERITY. Born C 1903. Kirkby Malzeard. Dau of John & Annie Batty. MASON VERITY. Born C1785.Stonebeck up. Died 30 September 1851. Married to Margaret Watson. Lived Bales House. 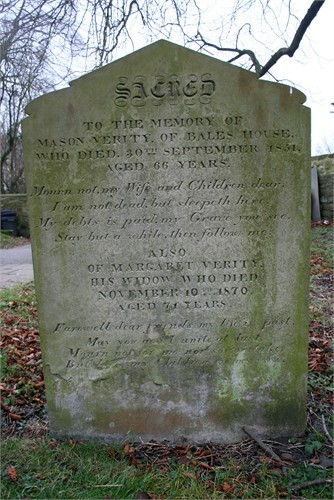 Grave of Mason & Margaret in Masham churchyard. MASON VERITY. Born 7 Nov. 1882 Healey. Son of Elizabeth of Gownley Foot. Married to Elsie [born 1906]. Sheep & Dairy farmer at Leighton Grange Healey in 1939. MATTHIAS FREDERICK VERITY. Born 1873 East Witton. Son of Christopher & Jane Ann Robinson. Married to Ada Britton. of Richmond. MATTHEW VERITY. BornC 1847 Stonebeck up. Son of John & Mary Mawer. MATTHEW VERITY. Born C1851 Stonebeck Down. Brother of John. MILDRED VERITY [NEE Ianson]. Born 30 July 1911. Died Nov. 1986. Married Christopher Edwin Verity. in Dec. 1934. MILES VERITY. Born 1790. Died 1849 Ramsgill. Married to Elizabeth Fovil. of Burneston. NORMAN H.VERITY. Born 15 Dec.1911. Son of Horenzo. Shepherd & Cowman. Unmarried in 1939. PERCY VERITY. Born Aug 28 1898. Stonebeck Up. Son of Thomas & Alice Jane. Married to Emma. Yorkshire Evening Post Newspaper report of May 1938. DEBT FIVE YEARS OLD Grewelthorpe Grocer to Pay for Seven Sheep. Judgment for plaintiff was given by Judge Stewart at Ripon County Court to-day in an action for the payment of £1 10s. for sheep bought five vears ago. The plaintiff. Arthur Barker Liddle, farmer of Kildale said that he sold seven sheep to Percy Verity, grocer, of Grewelthorpe. He had never received payment. Verity said that he paid Liddle one day when he met him on the moors near Pateley Bridge. Judge Stewart said that, it was one those cases in which payment was deferred until the debtor persuaded himself that he had paid, or ought not to pay. Defendant offered to pay at the rate of 5s per month, and this was accepted. PETER VERITY. Born C1811 Stonebeck Up. Brother of Thomas. Farmer at High Rigg in 1881. PETER CARTER VERITY. Born C1857 Ilton. Farmer at High House Ilton. married to Hannah of Coverdale. Report in Yorkshire Post 1932. RICHARD VERITY. Born C1892 Pateley Bridge. Nephew of Peter Carter Verity & Hannah. In 1911 he was a grocers assistant in Masham. SARAH VERITY. Born 26.4.1824 Healey. Dau of Mason & Margaret Watson. Married George Pratt of East Witton in 1853. SARAH VERITY. Born C1879 Masham. Married ?Oddy. Sister of William & Elizabeth. Housekeeper at Howe Farm Masham. A widow in 1911. SARAH ALICE VERITY. Born C1896 Stonebeck Up. Dau of Thomas & Alice Jane. SELINA VERITY. Born 1.July 1912 Kirkby Malzeard. Died March 1997. Dau of John & Annie Batty. Married Thomas Kirkman. THOMAS VERITY. Born C1809 Stonebeck up. A farmer at High Riggs. Married to Dorothy of Buckden. Living with brother Peter in 1881. Thomas a widower. THOMAS VERITY. Born C1826 Stonebeck Up. Died 1895. Son of Miles & Elizabeth Fovil. THOMAS VERITY. Born C1847 Middlesmoor. Son of Thomas [b1809]. A farmer at Fearby in 1911. Unmarried. THOMAS V. VERITY. Born C1866 Stonebeck Down. Son of John & *Elizabeth Stott. *Married to Alice Jane of Dallowgill. in C1886. had 10 children. Lived Sowmire, Healey in 1911. THOMAS ADAIR VERITY. Born C1873 York. Married to Bertha Mary Ormrod. of Embsay in 1898. In 1911 a Grocer living Park Street Masham. THOMAS VERITY. Born C1875 Sowmire. 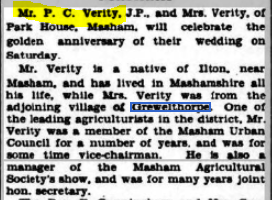 Living Bramley Grange Grewelthorpe in 1911. unmarried Farmer. THOMAS WILLIAM VERITY. Born 1877.East Witton. Son of Watson & Mary Horner. Married Annie Winifred. in 1905. Emigrated to Canada. He was a marine engineer. THOMAS VERITY. Died 7 March 1949 at Bramlea, Whitcliffe Lane, Ripon. Husband of Emma. Late of Bramley Grange Grewelthorpe. Father of Betty. Interred Ripon cemetery 11th March 1949. [Ref.Yorkshire Post]. VICTOR CARLING VERITY. Born C1894 Stonebeck Up. Son of Thomas & Alice Jane. VINCENT VERITY. Born C1891 Stonebeck Up. Son of Thomas & Alice Jane. VIOLET M.VERITY. Born 5 April 1892. Dau of Horenzo. of Ellington. A nursing sister [SRN]. WATSON VERITY. Born 26 Oct 1839. Died 29 June 1908 Masham. Son of Mason & Margaret Watson. Married Mary Horner. of Carlton Highdale in 1876 at Darlington. Lived Warren House Masham. Grave is in Masham Churchyard. WATSON VERITY. Born C1874 Ilton Healey. Son of William of Howe Farm. Married to Jane Ann Craggs. of Durham. in C1901. A farmer. They had 7 children. WILLIAM VERITY. Born 1821 Healey. Died 1897. Son of Miles & Elizabeth Fovil. Married to Ann Kirkbright. of Fountains Earth. WILLIAM VERITY. Born C1870 Stonebeck up. Son of John & Mary Mawer. WILLIAM VERITY. Born 17 Nov 1880. Married to Selina A. [born 1885]. Retired and living in Fearby in 1939. WILLIAM VERITY. 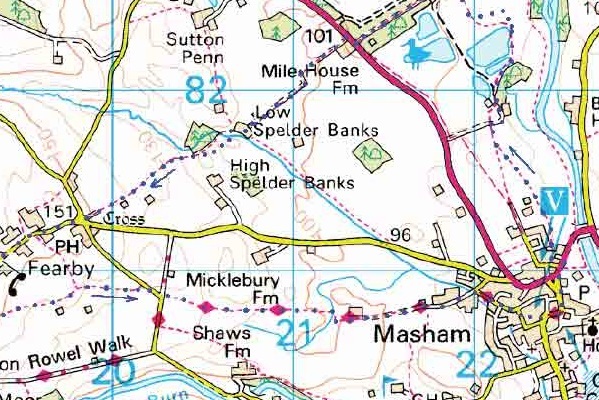 Born C1881 Masham. Farmer at Howe Farm Masham in 1911. WILLIAM D. VERITY. Born 30 1916. Dairy Farmer at The Grange Fearby in 1939. Please check all information at source if possible, as I cannot vouch for the accuracy of some of the data.Last update Dec. 2014. If you can add to this page please contact the site.